On August 25th, Demi Lovato and Nick Jonas brought their Future Now Tour to Rogers Arena in Vancouver. This package deal of a concert starring the two young pop singers’ promised to be a treat for joint fans of the dynamic duo, reviving nostalgia from their Camp Rock origins and showcasing their developed artistry in the present day. Mike Posner had the pleasure of charging up the crowd as the tour’s supporting act. The Detroit-based singer-songwriter performed a handful of his solo material, including his three most recognizable hits, “Please Don’t Go”, “Cooler Than Me” and “I Took a Pill in Ibiza.” With his unbridled energy and spontaneous spirit, Posner quickly won the audience over, getting everyone to throw their hands up in the air and jump up from their seats. Towards the end, Posner dipped deep into his philosophical side in the form of delivering freestyle poetry about reveling in the right here and right now. This unforgettable personal moment provided the perfect segway into the atmosphere of intimacy and intensity that was to come from the two headliners that evening. On many levels, Nick Jonas proved why he is the breakout solo artist out of his band of brothers. The youngest of the Jonas Brothers set the tone of his suave, smooth and provocative set from the instant he stepped out on the stage in suave shades and denim jacket and launched right in “Levels.” He blazed through his R&B/Dance-tinged pop repertoire, including tracks from his latest release, Last Year Was Complicated, and his self-titled debut. 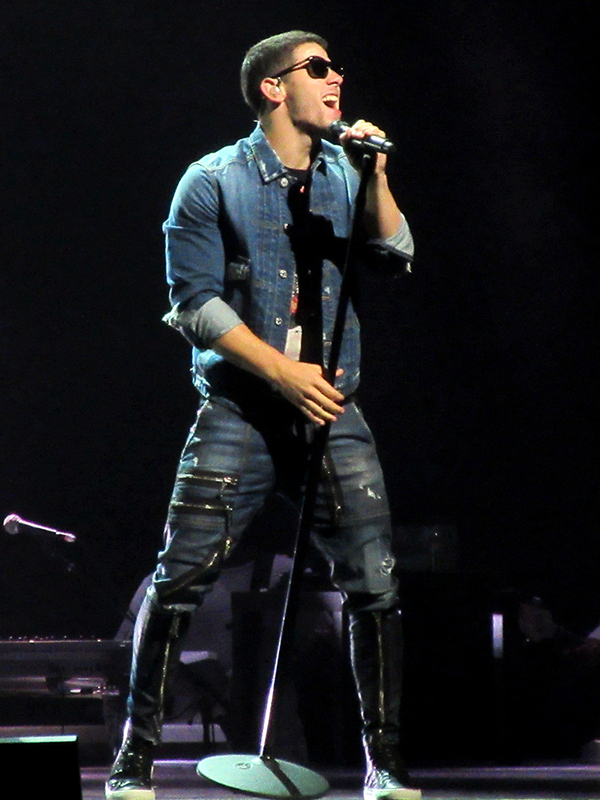 Among the songs were “Champagne Problems”, “Teacher”, “Bacon” (complete with visuals of sizzling bacon strips on the big panorama screen), “Good Thing”, “The Difference”, “Numb”, “Chains”, “Chainsaw”, and his most popular hit, “Jealous.” Over the past couple years since he embarked on his solo career, Jonas has grown exponentially as a performer with his willingness to be confessional with his lyrics and to push the boundaries of his vocal abilities in allowing his impressive falsetto flag to fly. Appearing before the audience on a raised platform, Demi Lovato made her royal entrance like the pop queen she is shaping up to be. 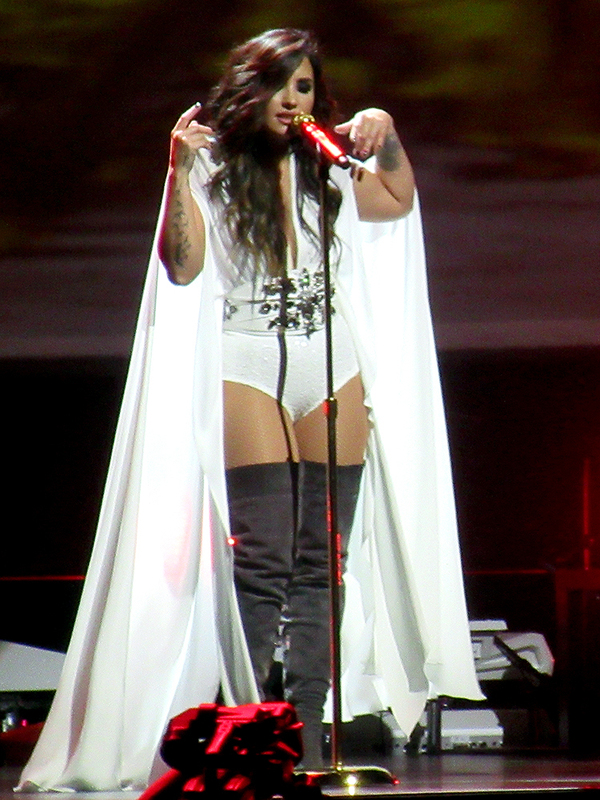 Oozing with confidence and boldness, she immediately commanded everyone’s attention as she strutted onto the stage and kicked off with her empowerment anthem, “Confident.” Lovato emitted even more high-octane and high octave energy as she followed the opening with two more uptempo numbers, “Heart Attack” and “Neon Lights,” with the latter turning the room into a full-on rave with the bright and blazing lights show. She paused to slow and strip things down with a beautiful ballad medley of “Fix A Heart,” “Nightingale” and “Warrior.” Lovato shared her new single, “Body Say,” which was a sneak peek into the next sensual and mature era of her musical direction. Her voice ran, roared and soared “For You,” “Lionheart” and the inspirational “Skyscraper,” and during the latter, she gave a heartfelt shout out to her fans in recovery, mentioning how she herself is nearly five years sober. As a special treat to her Vancouver fans, Lovato brought back one of her classic cover songs, Aretha Franklin’s “(You Make Me Feel Like) A Natural Woman.” It’s incredible to see how Lovato’s voice has gotten stronger, bigger, and better over the years. With her vocal power, vivacious presence, vibrancy and vulnerability, she is proving herself to be one of the most remarkable talents of her generation. Ending her set with the upbeat “Give Your Heart a Break” and the sultry party jam “Cool for the Summer,” Lovato sent the audience off with a summer concert experience that won’t soon be forgotten. 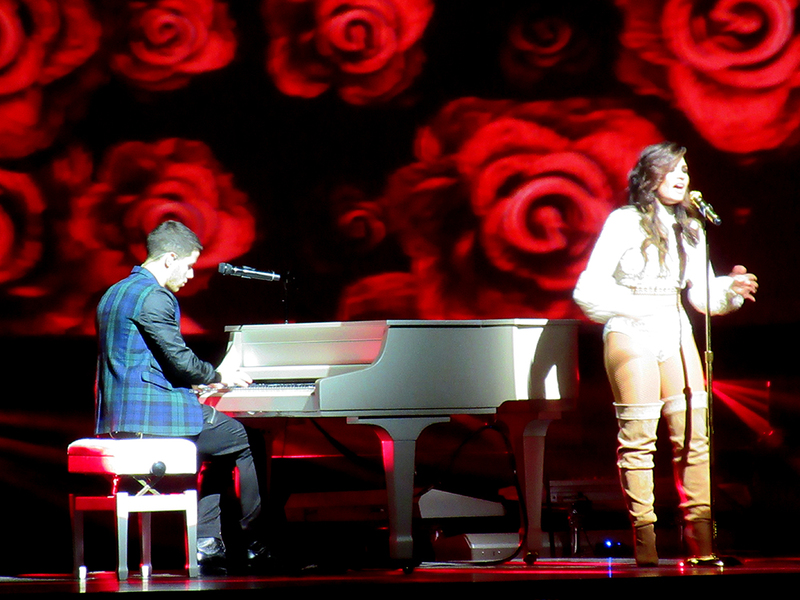 Partway through Lovato’s set, Jonas returned to the stage to accompany her on the white baby grand piano on her song, “Stone Cold”, and she returned the gesture to duet with him during his song, “Close”. As tour co-liners and business partners, Lovato and Jonas have a compatible contrast—he brings the cool factor, she brings the heat factor, and together, they share a warm chemistry as musical collaborators. The enduring years-long relationship between Demi Lovato and Nick Jonas is endearing to see in a highly competitive environment as the entertainment industry. Seeing these two young talents work together and push each other to be better performers is aspirational and an opportunity that would be great to see come into fruition frequently between music artists. Thanks to Demi and Nick, the future of pop music is now! Demi Lovato and Nick Jonas will be performing in cities across North America up until mid-October. For tour dates, visit the Honda Civic Tour website. Photos and videos courtesy of Elizabeth The.